I took ricotta cheese, but you can substitute with homemade yogurt cheese, mix it well in blender with a spoon of sour cream / unsweetened yogurt and a little sugar. 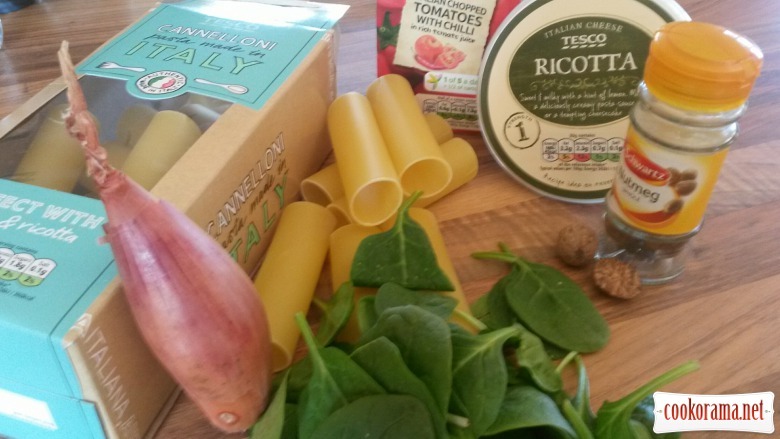 So make tomato sauce (you can take the ready, from can): fry in oil onion, garlic, celery to soft .Add tomatoes, 150 ml of cold water, basil, bring to a boil and cook for 20 minutes. Finished sauce can be ground in blender if you want uniform consistency. Pour tomato sauce at the bottom of the form, which will bake cannelloni. Cheese sauce: melt butter in a saucepan over low heat, add flour, stirring constantly pour milk in and cook until thick. Finally add the grated cheese and a little nutmeg (grated). 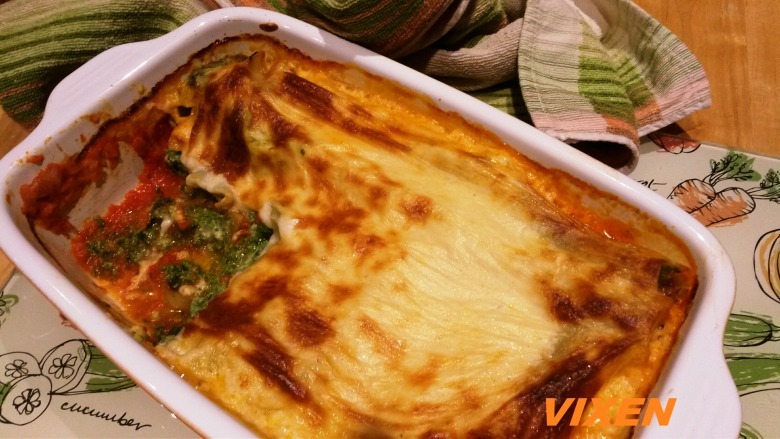 For the filling, mix ricotta with boiled spinach (can be cooked quickly in the microwave), add egg, grated cheese, salt and pepper, a little grated nutmeg. 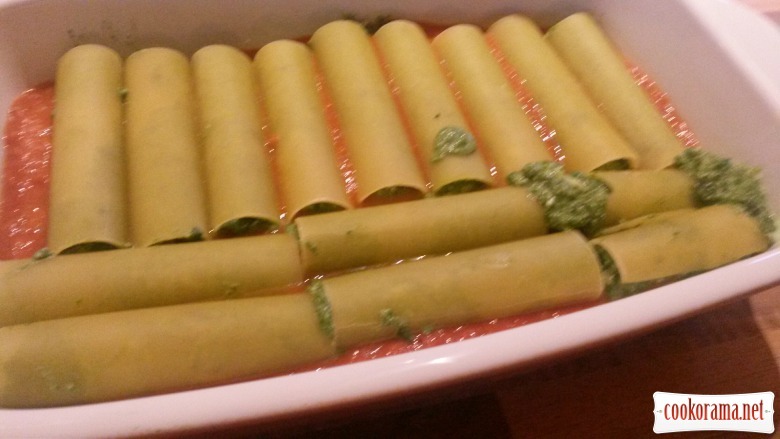 Fill the tubes (you can use cooking syringe or spoon) and put into the form (in a row) on tomato sauce. If top browns a lot, then cover with foil for 10-15 min. 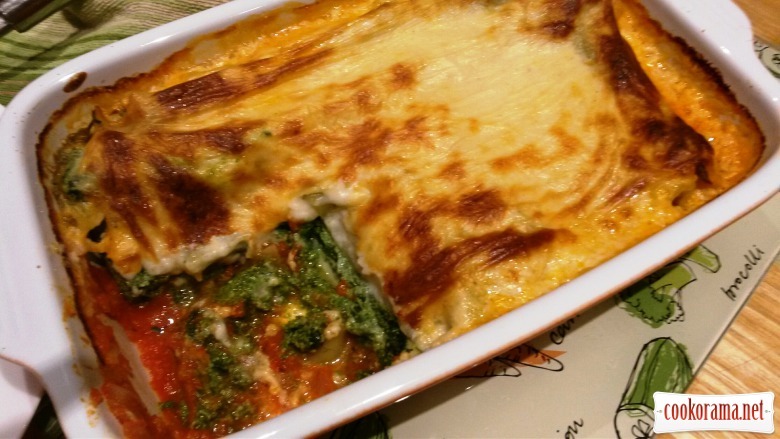 Top of recipe "Cannelloni stuffed with spinach and cheese"